When the headmistress and her brother keel over during supper one Sunday evening, the allure of freedom is too much for the young ladies of the school on Prickwillow Place and they make an impulsive decision to cover up the apparent murders. But the young ladies forget one thing—there is still a murderer at large, and they may be the next targets. 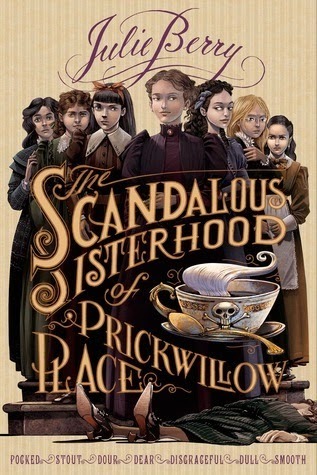 The Scandalous Sisterhood of Prickwillow Place is witty and sly, full of clever twists and dramatic secrets. Berry balances the large cast of characters with varying personalities with great aplomb and unfolds the mystery in quick precision. The young ladies and their thirst for excitement keep this farce entertaining and lively, and they are fiercely independent and resourceful without seeming too anachronistic. The quick pace of the novel heightens stakes, elevates tension, and forces the characters to get quite creative in how they cover up, investigate, and solve the murder, then save themselves from scandal. Berry’s latest is a winner. Cover Comments: I love the artwork on the cover and the interior of this book. It's appropriate for the time period, pretty, but also a bit morbid once you take a closer look.